Food Minerals Market size was over USD 1.4 billion in 2019 and industry expects consumption above 350 kilo tons by 2025. Increase in demand for natural food-based minerals majorly in nutraceutical and pharmaceutical industry may stimulate the market. Rapid urbanization & liberalization along with increase in consumer health consciousness and willingness to spend on natural products majorly in the U.S., Germany, UK, India, and China may further promote the market growth. Growing consumer focus on personal health issues such as weight, allergy, and stress management may enhance industry growth. Food supplement market demand in Italy was over USD 33 billion in 2017. Rise in logistics analytics and upgraded distribution along with improving distribution channels such as specialty health stores, supermarkets, pharmacies, and online portals is positively influencing food mineral market size. Food minerals supplements provide anti-inflammatory, anti-oxidizing, heartbeat, blood pressure, and insulin regulating characteristics. In 2016, over 1.5 million people in UK were diagnosed with circulatory system diseases which may further influence global market growth. Natural minerals are extracted from various sources such as organic egg shells, clams, oysters, marine corals, and plant-based derivatives. These products are used in manufacturing supplements under diverse product lines such as eye health, allergy relief, brain & memory support, heart health, and weight management. In Spain, over 300 thousand women were diagnosed with osteoporosis in 2016. These are used to treat & reduce risk of wide variety of cardiovascular, endocrinal, musculoskeletal, digestive, and renal diseases. Moreover, increasing trends in non-GMO, gluten free, dairy free, and soy free supplements owing to its benefits such as regulation of insulin, cholesterol & abdominal fat levels and weight management characteristics is expected to boost food minerals market growth. Rising allergies & weak immune systems owing to increase in pollution, stress, and hectic lifestyle schedules will increase the dependence on natural supplements. Anti-allergy care market in Brazil was over USD 135 million in 2015. Some of the major allergies includes pollen related allergies, sinus infections, migraine, itching, digestive disorders, and skin problems which is likely to boost industry market growth. Increase in consumer awareness and governmental regulations are diverting manufactures to focus stringently on selecting raw materials, correct labelling & providing instructions on dosage and side effects which may stimulate the market size. Magnesium food minerals market size may surpass USD 1.2 billion by end of projected timeframe. It plays an important role in regulating over 300 enzymatic reactions such as synthesis of fatty acids & proteins, transmission of nerve impulses, and metabolism of food. Magnesium is widely used as energy supplement owing to its energy generating characteristics as the energy molecule adenosine triphosphate gets biologically active under the influence of magnesium ions. It further helps in regulating potassium and sodium levels which will stimulate the global market demand. Calcium food minerals market size should witness gains at over 5.5% by 2025. It is essential for healthy musculoskeletal functioning. Calcium helps in the growth & maintenance of health bones, teeth enamel, muscles, and blood. It also plays a vital role in cardiovascular muscle contractions & reduces the risk of hypertension and coronary heart disease. These products are available in various forms such as tablets, capsules, powders, and liquids which will further boost the market growth. 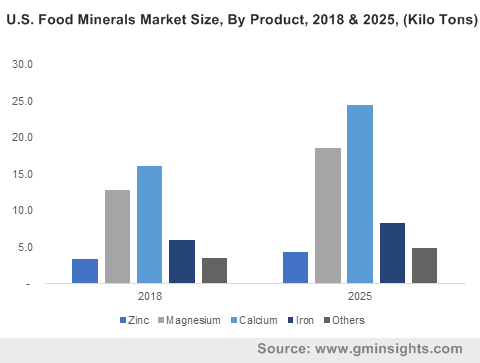 Zinc food minerals market size was valued at over USD 55 million in 2018 and is expected to witness high gains upto 2025. Zinc plays an important role in regulating metabolic activities of RNA & DNA. It plays an active participant in cell metabolism and division. Increasing cases of depression & dementia owing to busy schedules & improper diet will influence the food minerals market for zinc products owing its neuropsychiatric and immunological properties. 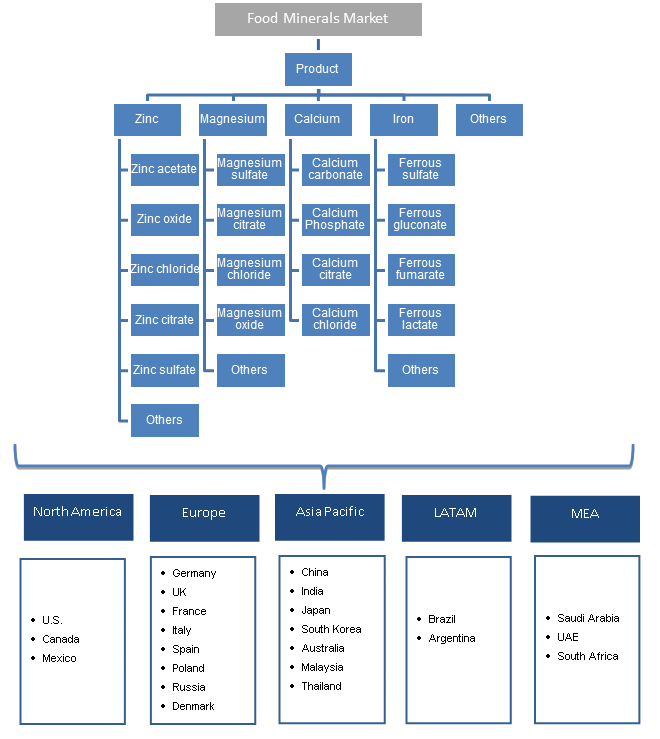 North America driven by Mexico, Canada and the U.S. food minerals market demand may witness growth at over 5% by 2025. Rising cases of obesity among youth in the region has increased focus towards healthy lifestyles & weight management products promoting overall physical health and wellness. Obesity is a major factor increasing cases of diabetes, hypertension, cardiovascular diseases like stroke, coronary artery problems, and angina. All these factors are inclining consumer’s shift towards natural mineral products such as calcium, magnesium, and zinc thereby stimulating regional industry growth. Europe food minerals market demand led by UK, Germany, and France stood at over USD 425 million in 2018. Increasing demand for supplements derived from natural sources under diverse segments such as allergy relief, cough & cold support, immune support, heart health, and energy support will propagate market growth. Increase in consumer consciousness & advancement in manufacturing techniques without artificial sweeteners & preservatives is likely to drive the market. Asia Pacific, led by India, South Korea, Japan, and China food minerals market size may surpass USD 630 million by the end of forecast period. Growing pharmaceutical & nutraceutical industry owing to change in consumer perceptions on weight loss & mental health issues such as anxiety and stress may stimulate food minerals industry growth. Consumer shifting towards preventive measures which requires a balanced intake of minerals & vitamins for regulating insulin, cortisol and adrenaline levels will further regional industry growth. Food minerals market share is fragmented consisting of several key industry players such as Bee Health, Bayer, Youngevity, Solgar, Novartis, Pharmaca, and Rainbow Light. Manufactures are involved in stringent research & product development by forming joint ventures and strategic partnerships thereby enhancing the global market share. Minerals are inorganic nutrients that cannot be synthesized biologically & are essential for overall health & growth. Most minerals elements that are ingested by organisms are in the form of simple compounds. Various minerals in the human body constitute of phosphorus, calcium, zinc, iron, magnesium, and potassium. They have diverse benefits ranging from biologically triggering energy molecule adenosine triphosphate, maintaining bone & muscle health, regulating anxiety inducing chemicals such as cortisol & adrenaline, and regulating insulin levels.